Herbaceous annuals,medical plant lobak have approximately 1 meter height, stem tubers to form a soft, pale white. Single leaf, oval, serrated leaf edge, tip and base rompang green and hairy. Inflorescence form bunches, at the tip of the stem, greenish yellow stamens, petals green, white oval crown. Brown oval fruit. Seed oval. 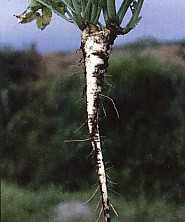 Horseradish root is the influence of bladder stones seen at doses of 1.2 grams, 12 grams, and 60 grams gram/200 bb. The higher the dose given to greater destruction of bladder stones.